My husband would like you to know that his grandfather was from a tiny town in Norway called Odda. His grandfather immigrated to the United States a century ago and wound up in Mississippi, where he married, fathered three children, and died long before my husband, Karl, was born. Karl believes that he inherited a deep love of boats and a need for large bodies of water from this grandfather he never met. He believes this water/boat thing is wrapped in the double helix of his DNA, which makes it a shame that we now live in landlocked Tennessee. At night, he looks at boats on the internet and falls asleep to dream of fjords. After 22 years of watching my husband wrestle with his inner Norwegian, I decided to do something about it. I decided to take him to the motherland on a ship. The boat-loving, water-loving part of Karl is drawn to a life that is practical and rugged. The kind of boat that should bear him to his ancestral home would not be the sort that features a karaoke bar or spa pedicures. When going to the land of the Vikings, one should not arrive on a ship that twists one’s bath towel into the shape of a goose at bedtime. So I booked our northern passage on Hurtigruten, on the M.S. Nordkapp. This is not to say the Hurtigruten ships are anything less than comfortable, but this is not a silly operation. Founded in 1893 to transport passengers and post through intricate waterways, the shipping line was an essential part of rural Norway’s eventual modernity. Thanks to Hurtigruten, a letter written in Bergen (at the bottom of the country) could be delivered in Kirkenes (at the very top) in a week rather than half a year, and the young person hoping to flee Kirkenes would have a way to do so. It was sunny when we arrived in Bergen, and it stayed sunny for about 20 hours a day. The weather was warmer than anyone had expected, and my husband said he wanted to buy a shirt or two just to have something lighter to wear. He got some pants, too, and a belt and some socks. When we were finished, I reveled in the cherry blossoms and the wide swaths of yellow tulips, while Karl stood at the water’s edge and looked at the boats. Then the ship came to harbor and we boarded. By the standards of cruise ships, this one was small, holding 622 passengers when booked to capacity, but by the standards of the old Viking ships, or Nansen’s noble Fram, the famous Arctic exploration vessel, it was still big. Our cabin was styled with a sturdy Scandinavian sensibility. There was a place for everything, and so we put everything in its place. My husband, that happiest Norwegian, then went out on deck to stare at the fjords and the passing boats. 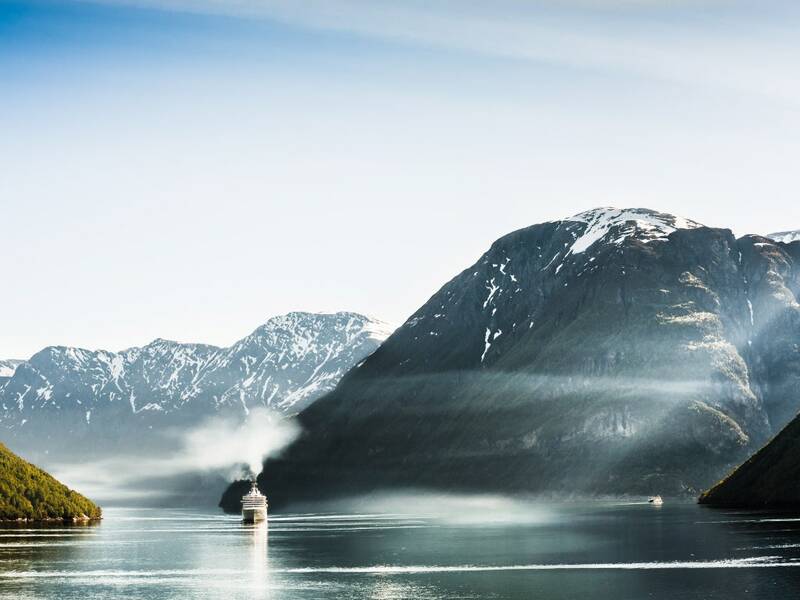 A Hurtigruten ship leaves Bergen every day of the year, which means 12 vessels passing each other on their way to Kirkenes or back, each ship stopping at a total of 34 ports on the 12-day round-trip. While the mightyNordkapp no longer delivers the mail, it is still a freighter. Wrapped pallets of carburetors were put into the cargo hold in Molde and taken off in Bodø, kitchenware was loaded in Stamsund and came off in Hammerfest. In some ports the ship stayed for hours, in others it was 20 minutes. And it wasn’t just packages that Hurtigruten picked up and delivered, it was Norwegians. They use the ship as a ferry to the next town or maybe five towns up the line. One day on deck I saw two small blond girls with their mother, the next day it was a group of older men in matching vests. They were on the ship and then they were gone. It made sense, because running a cruise line for passengers up to the top of Norway was one thing in summer and something else entirely in winter. Hurtigruten had found a way to stay afloat year-round. While the passengers and pallets came and went, we watched the never-ending film of rocky atolls, small islands, little villages, and fishing boats that slid past the windows. It was almost impossible to look away because every frame in the ever-changing view was so singular: a little red wooden house perched atop a rocky crag, with no other houses in view. Who were these people, and what were they doing out there? Hurtigruten travels up and down the Norwegian coast using 13 ships, including the Nordkapp. The Germans we met—as well as the English, the Swedes, the Swiss—had all spent their lives dreaming of exactly this Hurtigruten voyage through the fjords. “My grandfather was from Odda,” my husband told one of the Norwegian passengers beside him at the window. Odda, it turned out, was obscure by even Norwegian standards, and Karl’s pronunciation wasn’t the best. In Ålesund, we disembarked to walk through town and admire the Art Nouveau flourishes. Here’s the thing about Norway: It has burned to the ground more times than can be counted—blame this on the wooden buildings or the long winter nights that require too many candles. It seemed that every city in the country had been rebuilt at some point. Ålesund was so consistently perfect, it looked like it had been snapped together with Art Nouveau Legos, if such things were to exist. When it started to rain, my husband noted that his raincoat wasn’t up to the job and dashed into a ship supply store, where he found one better suited to Norwegian weather. He got some proper rain shoes as well and a Helly Hansen duffel bag before we headed back to the ship. Every day we got off the Nordkapp. In Trondheim we visited the Nidaros Cathedral, which was built by Catholics and later lost to Protestants—meaning that Saint Olaf, the most essential of Catholic Norwegian saint-kings, was buried beneath the stone floor of a Lutheran church. We visited the Ringve Museum of musical instruments, and our guide played the harpsichord and the pianoforte, looking like he had just stepped out of an Ibsen play. My husband ducked out to buy a hat and gloves because it had gotten cold. At the next stop he found a warmer jacket. It wasn’t until a few days later, when I was looking for Karl on deck, that I realized I could no longer find him. He was dressed like all the other Norwegian men. They stood together, backs to the room, admiring the water and boats. We kayaked with two English guides who had come to Norway to visit and never went home. In our kayak I understood that decision because the light on the water and the high, snowcapped mountains were more beautiful than anything I’d ever seen. The guide who took us to the Northern Cape had left Rhodesia for Norway. Karl told each of them that his grandfather was from Odda, and each asked him to repeat the name. The farther north we went, the shorter the trees, until there were no trees, only reindeer. The endless rocks that popped out of the water like unexpected wisdom teeth were furred with nothing more than moss. Once we passed into the Arctic Circle, there were fewer villages, fewer lonely houses, fewer birds. Karl paced the deck, leaning into the bitter wind. “We should live here,” he said, looking out at the rocks and the cold gray sea, no doubt thinking that Odda must be a place very much like this. Have you ever given someone the moon, only to discover he wanted the sun and the stars? I aimed to show my husband how much I loved him by taking him to Norway, which was very different from showing him how much I loved him by agreeing to move to Norway. He was right, of course—it’s a spectacular country, even when the freezing rain blows sideways over the barren land. When I told him we weren’t moving, he looked across the fjords and nodded stoically. Maybe if I’d said yes he would have laughed, but I don’t think he was bluffing. There were sirens in those rocky waters singing love songs to the men in their passing boats. They wanted their Norwegians to come home. Copyright © 2019 Escapes Magazine.